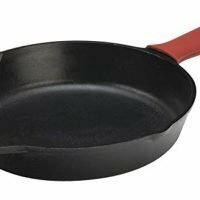 Black bean skillet dinner: For nights when cooking feels too hard and about all you can muster is pulling a bunch of ingredients from your pantry/cabinets and cooking them in one pan. 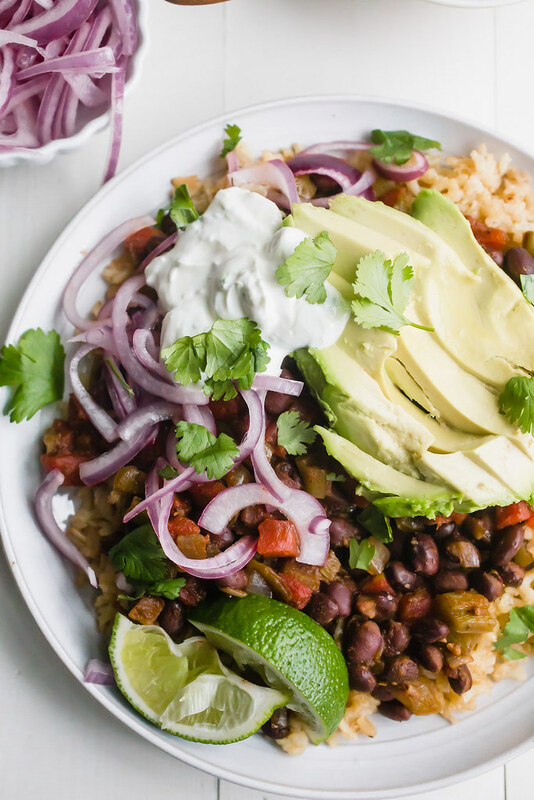 Also: vegetarian burrito bowls FTW! There’s something so cozy to me about cooking a full meal in one pot or pan. This one-pot creamy sausage pasta has been one of the most popular recipes on the site since I shared it with you 3 years ago and it’s not just because it’s a flat-out awesome meal. It’s also the one-pot thing! These bangers and colcannon and one-pot farro with tomatoes meals are other excellent examples. And when you can make a Tex-Mex type of meal as a one-pot meal in a cast iron skillet, you can count me ALL IN. I mean, SIGN. ME. UP. This black bean skillet dinner is full of plant-based protein, which not only makes for a healthier meal option, but a cheap one, too. Because, beans = cheap meal! And when you’re spending more money than you care to admit on adorable baby sleepers, you’ve got to pinch pennies somewhere else. It’s all about the balance, right? ANYWAY! With a bunch of pantry staples, as is my modus operandi, like canned tomatoes and black beans, onion, garlic, jalapeño, and some spices, this fantastic meal comes together so easily too! I made some brown rice as a hearty grain bed for the black beans but adding rice to this meal certainly isn’t a necessity. 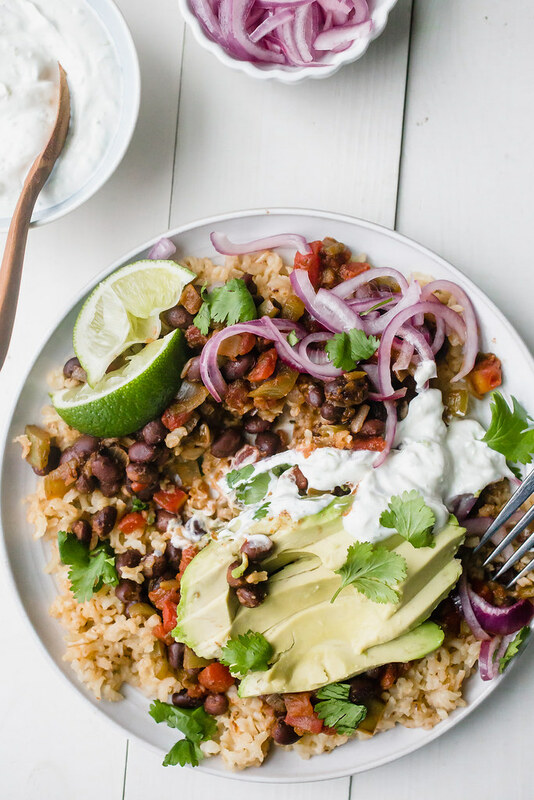 The rice DOES make this meal more like a vegetarian burrito bowl, especially when topped with sliced avocado, pickled red onions, and lime sour cream, so if that’s your thing – and it’s TOTALLY my thing! – go ahead and make the rice. The rice will cook in about the same amount time it will take you to prep and make the rest of the meal anyway. So you may as well just make burrito bowls here! And can we please talk about the pickled red onions?? Because oh. my. goodness!! They’re soooo simple to make and the tangy flavor from the lime juice (instead of vinegar!) contrasts so perfectly with the hearty and spicy black beans. 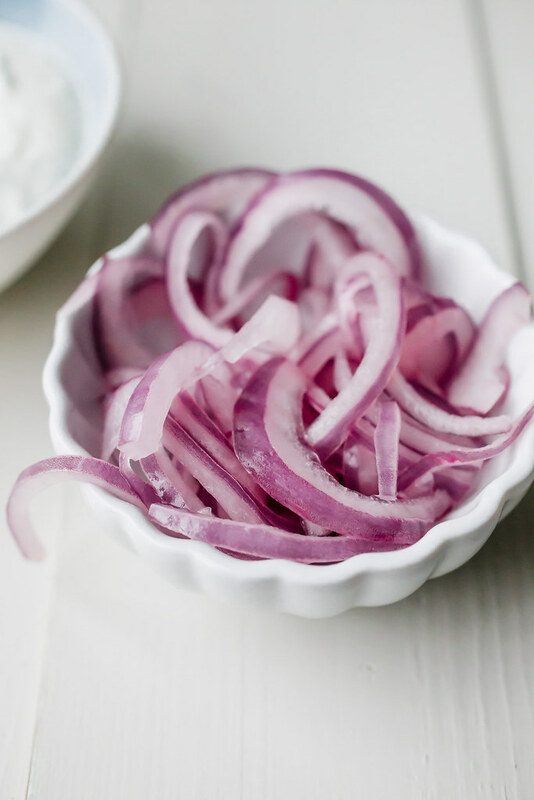 All you need to do to make the pickled red onions is mix lime juice, sugar, and salt into a bowl of thinly sliced red onions and let them marinate for about 15 or 20 minutes. You’ll stir them every so often so all of the onions start to soften but THAT’S ALL IT TAKES! So easy, right?? Go ahead and repeat this meal as you made it the first time. The black bean mixture reheats really well. Serve the black beans on the side of some grilled chipotle honey glazed chicken or make a foil packet salmon, halibut, or cod meal. Make tacos! All hail the mighty taco!! 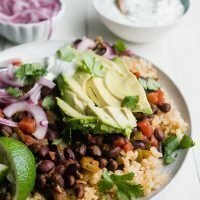 Piled high in crunchy taco shells with extra avocado, those outstanding pickled red onions, and lime sour cream – and maybe a sprinkle of sharp cheddar or monterey jack if you so desire – and you’ve got a completely transformed meal from this black bean skillet dinner, with virtually no effort on your part. Make a vegetarian taco salad. Similar idea to this skillet dinner and the tacos, but layer the black bean mixture and your favorite toppings atop some chopped lettuce or baby kale. If you’re feeling up to it and want to whip up some jalapeño cheddar biscuits to go with this black bean skillet dinner while the beans simmer, I say GO FOR IT! Does feeding your family get any easier than this? I think not! 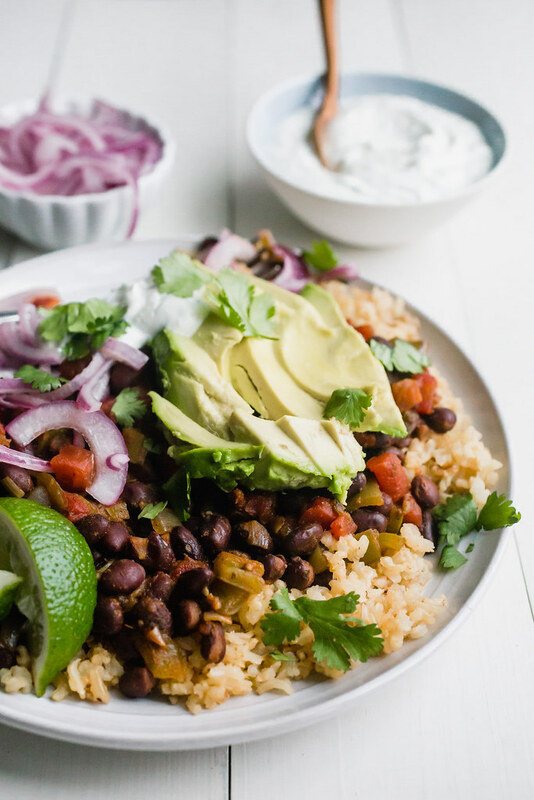 Black bean skillet dinner is THE MEAL for you if burrito bowls are your thing! It's a vegetarian meal with spiced up and saucy black beans and all the toppings over a bed of rice. 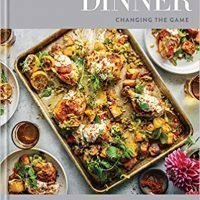 This is the perfect weeknight dinner that makes enough leftovers for lunches or that can be repurposed into tacos another night. To make the lime sour cream: Mix all of the lime sour cream ingredients together in a small bowl; set aside. To make the pickled red onions: In a small bowl, squeeze the lime juice over the onions, and sprinkle with sugar and salt. 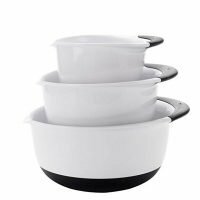 Stir everything together and set aside. Stir occasionally while you make the rest of the meal. To make the black beans: Heat the oil in a 12-inch skillet over medium-high heat then toss in the onions and jalapeño, sprinkle with a pinch of salt and pepper, and cook, stirring occasionally until softened, about 7 to 8 minutes. Stir in the garlic and spices and cook for 30 seconds to 1 minutes, until fragrant. Mix the black beans, tomatoes, and water into the pan, bring to boil then reduce the heat to a simmer. Cook, stirring occasionally, for 10 to 15 minutes, until the beans have softened and mixture has thickened. 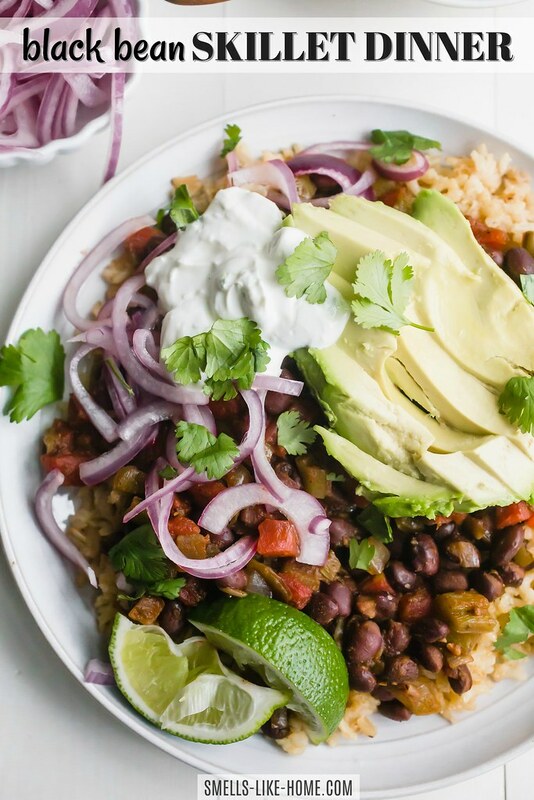 To serve: Serve the black beans over the rice (if using) and top with avocado, cilantro, the pickled onions, lime sour cream, and squeeze of lime juice. 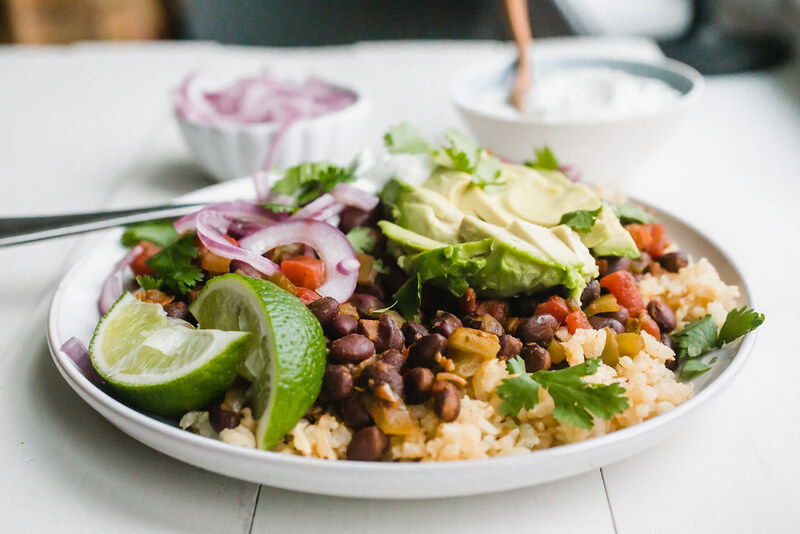 While this recipe doesn't specifically call for rice, serving the jazzed-up black beans over a bed of it turns this already delicious meal into a vegetarian burrito bowl. And HELLO! Who could possibly turn that down for dinner?? White rice will cook in about 17 to 20 minutes and brown rice, in about 45 to 50 minutes, and both will cook easily in the time it takes you to prep and cook the rest of this black bean skillet dinner. If you have an Instant Pot, the rice will cook in about 7-10 minutes! If you can find cubanelle peppers (also called Italian frying peppers) go ahead and grab them at the market. Otherwise, I think 1 poblano will do. If you're standing at the fridge trying to cobble together this meal and don't have either pepper, a green or red pepper will work too. Or skip the freaking peppers altogether - this meal won't suffer without them!